Lets chat about a topic which often we only speak about in hushed tones, Periods. I have blogged about my lady problems before and mentioned I wanted to learn more about having an eco-friendly period. Most Green Bloggers will promote menstrual cups as a replacement for tampons but I am turning my attention to pads and liners, as those are the products I prefer using. 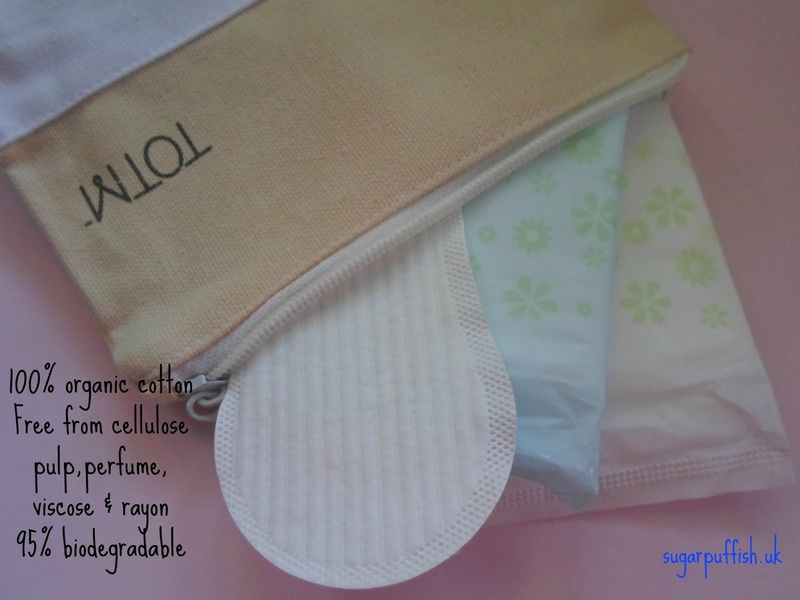 I recently was approached by TOTM (Time of the Month) they offer 100% organic cotton sanitary products (pads & tampons). TOTM products are free from cellulose pulp, perfume, viscose, rayon, chlorine, dioxin and 95% biodegradable. I have received samples. I won’t be reviewing right away but I wanted to bring TOTM to everyone’s attention. A little research into familiar brands of tampons and pads reveals some thought provoking facts about the ingredients and materials in these products. I have always been concerned about the environmental impact on landfills but recently started to wonder if my problem periods could be linked to toxic ingredients. I have noticed a trend for fragranced sanitary pads and that's not ideal for sensitive skin and allergies. It drives me crazy that manufacturers feel my natural bodily functions are so repulsive that I need to scent them with air freshener. Do I really need my underwear to like smell alpine fresh? TOTM offer a subscription service via their website. You can receive monthly deliveries of the products you need, on a date chosen by you. Alternatively, you can purchase through Feel Unique. Packaging is sleek and discreet which makes a pleasant changed from all the lurid floral designs. Are love heart supposed to make my period more enjoyable? When Aunty Flow visits next month, I will update you on how I got on with the pads. Until then, do check out TOTM’S website for further information. Have you switched to eco-friendly feminine products? I struggle to track down Natracare ones but I'm not sold on them completely so hoping these will be a bit better, I like the idea of a subscription service. It is good to see another brand as I haven't found many out there. a while back Always suddenly scented their night towels and there isn't an alternative option, it really annoyed me. Adjusting to the cost is definitely something I am getting used to. Really like that you can subscribe and get them sent when you need them, I'm all for things landing on my doorstep when I need them. Also agree that the fragranced things you can buy from the supermarket are completely vile. Thanks for this, I shall investigate more. I have had a guilty feeling for years about my period habit. Throwing something unfriendly to the landfill gave me such a hard feeling. Plus, yes, I was disturbed by the fact of toxic on sanitary napkin products! Phew! Thanks for your comment. I haven't made the step to cloth pads. I have researched them and they are available here in UK. I certainly haven't dismissed these products just not ready for them at this moment in time.